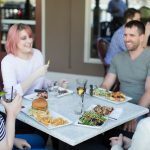 Brandt’s Creek Pub is dedicated to creating an inviting atmosphere for you and your friends to catch up over happy hour, gather for the best burger in Kelowna or share stories over wing night. 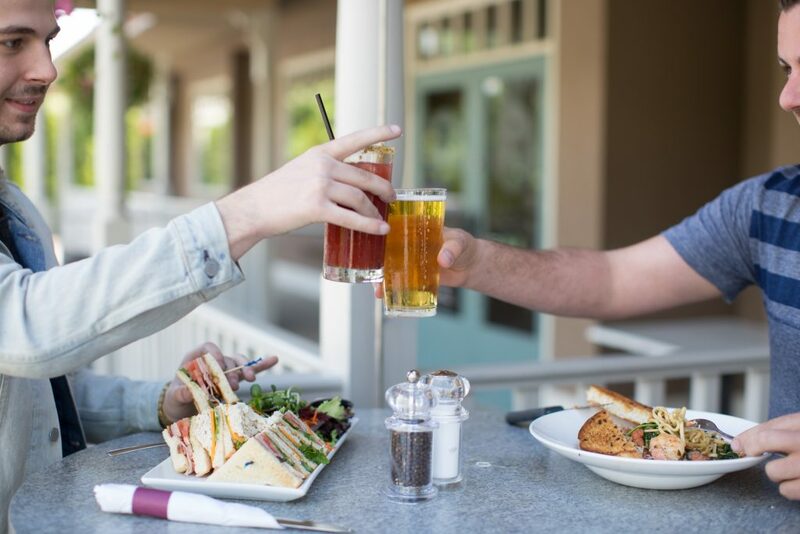 We are always striving for the best, so we’ve compiled the top three benefits of dining out with your friends at your favourite Kelowna pub. Since Kelowna is well-known for its stunning nature, awe-inspiring mountains and incredible climate, it’s a clear favourite for patio-lovers. Now that the smoke has cleared, the skies are blue and the weather is exceptional, it’s time to get your friends together and enjoy a great selection of incredible and delicious comfort pub-food classics, carefully crafted with fresh, premium ingredients. Take in the stunning view of the mountains from our patio, soak in some of your daily vitamin D intake and unwind patio-side with your closest friends. 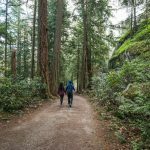 You’ll simultaneously reap the health benefits of enjoying some fresh air and the psychological benefits of socializing with others. 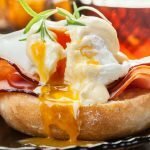 Dining out is one of the best ways to disconnect from social media and other modern-day distractions in order to have a conversation with the people around the table. Going out for a meal with friends can be a great way to deepen friendships, connect with colleagues, or even get to know a romantic interest better in-person. The benefits of engaging with the people around you, rather than being distracted by notifications, work obligations and everything else that takes you away from the present moment are endless. Giving your friends some undivided attention means you are making an intentional effort to foster healthy and meaningful relationships. It also forces you to slow down and just enjoy the moment, which increases happiness and alleviates depression. What better time to do that than over a great plate of wings or an unbelievably great rack of apple bourbon BBQ sauce and ribs? 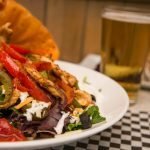 Searching for the best happy hour in Kelowna to celebrate your friend’s birthday? How about the best wing night in Kelowna to celebrate a win at work with your colleagues? Brandt’s has got you covered. We’ve got a great selection of food, a rotating tap of craft beers, happy hour specials and weekly features including Tuesday wine and steak special, Wednesday wing night, $2 ½ Burger Thursday and more all at affordable prices. 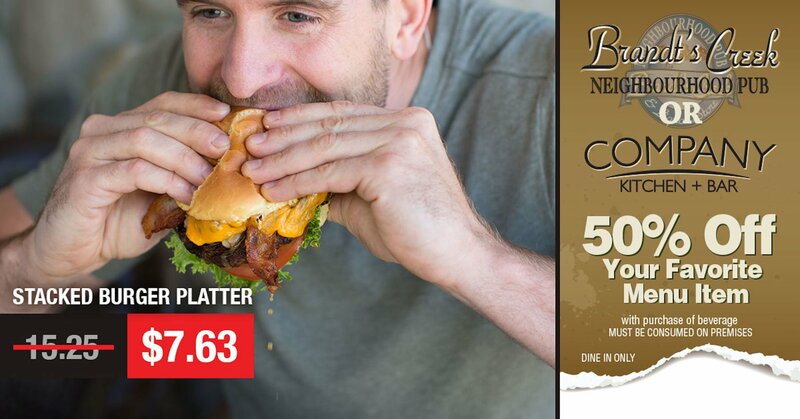 Try your friend’s burger, they try a bite of your apple bourbon BBQ ribs and everyone wins. So gather your friends, family or colleagues – It’s easier to relax and open up when you’re enjoying great drinks and sharing delicious food in a comfortable environment. Getting together over a meal is one of the best ways to celebrate any big or small occasion from birthdays to winning your hockey match. 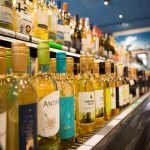 If you choose to continue your celebrations after dinner at Brandt’s, stop by Brandt’s Creek liquor store for a great selection of spirits, craft beers and your favourite local Okanagan wine. Spend $50 at our liquor store and receive 50% off any item on our entire menu at Brandt’s Creek Pub or Company Kitchen & Bar. Brandt’s Creek Pub is one of the most well-established and popular Kelowna pubs among local pub-lovers. 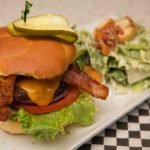 Brandt’s menu features a great selection of pub-favourites, including one of the best burgers in Kelowna, a growing selection of local wines and a rotating tap of all your favourite craft beers. Plus we’re known for having one of the best wing nights in Kelowna! 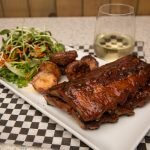 Looking for a Kelowna pub with incredible dishes and drinks to enjoy while you catch up with your friends? 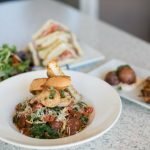 View our menu and visit Brandt’s Creek Pub today.